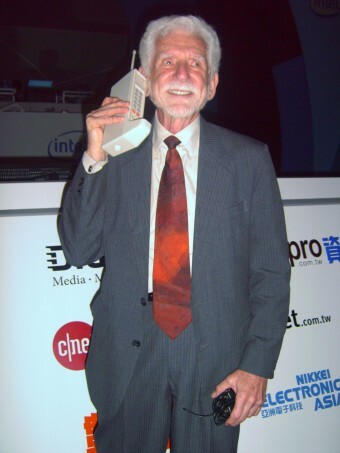 On this day in history, 1973, a Motorola employee, Martin Cooper, publicly demonstrated the world’s first handheld mobile phone by placing a call to Joel Engel, the head of research at AT&T’s Bell Labs using the phone. Engel and his team were Cooper’s chief rival and had also been attempting to make the world’s first handheld mobile phone. After demonstrating the phone to the press while standing on Sixth Avenue in New York City, calling Engel and others, Cooper then let a few members of the press use the phone to show that it would work for making calls to anyone. The handheld phone used on this historic call was a prototype developed by Cooper and his team of engineers in just 90 days. It comprised of the handheld unit itself, which was 9 x 5 x 1.75 inches, then a base station on the roof of what is now the Alliance Capital Building in New York City. The base station was in turn connected to AT&T’s telephone system. You’ll often read that this was the first ever handheld mobile phone call, but this isn’t correct. The unit was tested thoroughly before the public demonstration with the press. Funny enough, supposedly the first ever actual test of this prototype resulted in the tester accidentally calling the wrong number. Cooper also demonstrated the device to the FCC before it was publicly unveiled. Motorola was trying to convince the FCC to allocate frequency space for cellular communications to be available to private companies. This first handheld cell phone had only 20 minutes of battery life when talking, but as Cooper stated “that wasn’t really a big problem because you couldn’t hold that phone up for that long.” (The phone weighed 2.4 pounds.) Once the phone battery was drained, it took 10 hours to charge back up fully. While the prototype only took 90 days to make, the commercial phone that resulted from it took much longer to finalize and bring to market, as one might expect given the infrastructure that was needed to support it. 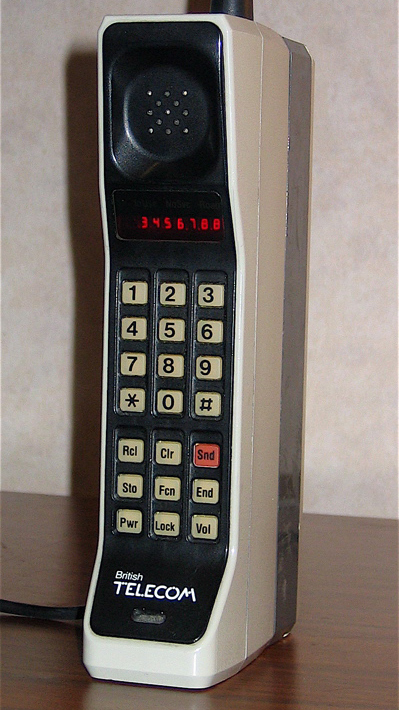 As such, it was a full 10 years later before the first commercial cell phone, the DynaTAC 8000x (“Dynamic Adaptive Total Area Coverage”), hit the market on March 6, 1983. This phone weighed only 1.1 pounds, had 30 minutes of battery life (8 hours of standby), and was initially priced at $3,995, which is about $9300 today. Given the high cost of this phone and others like it, it took a full seven years to reach one million cell phone subscribers, hitting that figure in 1990. In the last two decades, though, the cell phone market has exploded, with an estimated 4 billion cell phones in use today, of which around 1 billion are “smart” phones. Further, there are currently far more handheld mobile phone subscribers than there are wired phone subscribers. In the 1930s, it was possible to place telephone calls from certain passenger ocean liners. These calls cost about $7 per minute, which is just shy of $100 per minute today. Car based mobile phones have been around since the 1940s, but generally needed significant enough power that you could only use them with the engine running. 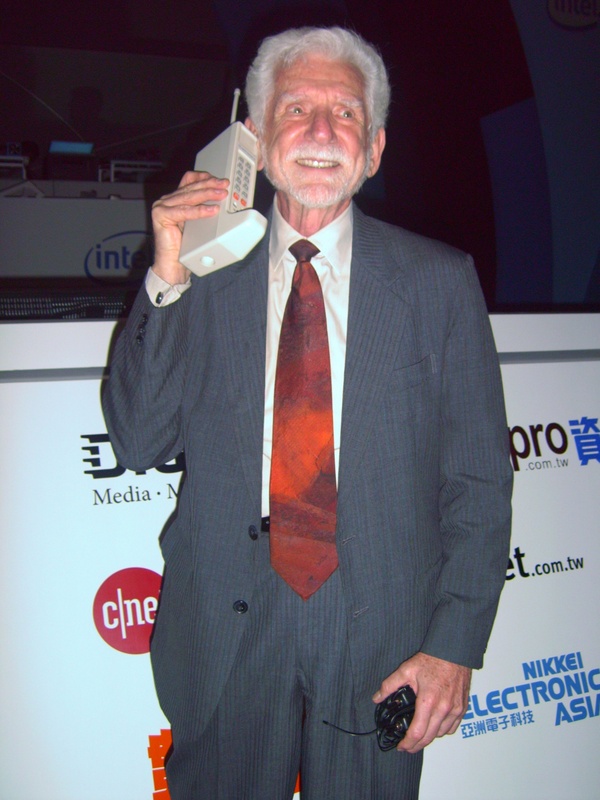 Martin Cooper not only helped invent the first handheld mobile phone, but also played a key role in the development of pager technology. Further, he fixed a flaw in Motorola’s quartz crystals, which were made for radios. Why this is significant was that it allowed for mass production of quartz crystals for use in wrist watches, for the first time. Cooper once stated that he was inspired to try to develop a handheld mobile phone after watching Captain Kirk use a communicator on Star Trek. Cooper also has a “law” named after him. Cooper’s Law states that our technology is advancing at such a rate that the number of different wireless communications possible in one location, at the same time will double every 30 months. This “law” has held true since the first transmission by Guglielmo Marconi in 1895. To illustrate, due to the method of transmitting this first signal, with a spark gap transmitter, it took up most of the radio spectrum to send this signal. So the technology at that time more or less just allowed for one signal to be sent at any given time at a certain location. Since then, every 30 months, the number of signals that can be transmitted at one time in one location has doubled. Given the amount of square miles Marconi’s first transmitter blanketed, only about 50 separate signals could have been sent at one time on the entire planet without interfering with one another. Although Apple’s iPhones generally receive the most hype and publicity today in the cell phone market, over 96.5% of all mobile phones presently in use are not iPhones. Further, Android and Nokia are king by far in terms of the most used OS on smart phones. Joel S. Engel, who received the first publicly demonstrated handheld mobile phone call, also worked on the guidance systems for the Apollo Program. “Cellular phones” or more common today “cell phones” get their name from the fact that areas served by towers are divided up into “cells”. The first use of the word “cellular” in this fashion was in 1977. 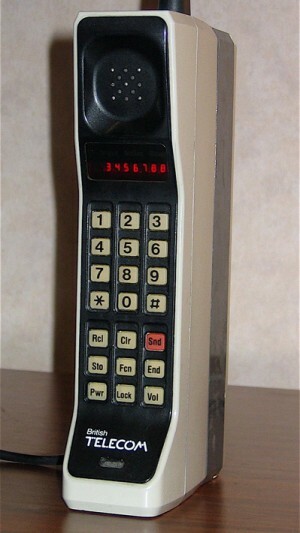 The first documented use of the word “cell phone” was in 1984. At current growth rates, it’s estimated that mobile internet usage should surpass “regular” computer internet usage by 2014. In the United States, 86% of the time people are using the internet on their mobile device, they are simultaneously watching TV. The average American smartphone user also spends about 2.7 hours per day socializing on their phone. The highest number of active phones per person for a country is Montenegro at 192.5% or nearly two phones per person. The runner up on that list is Hong Kong at 187.9%.